Ellie is broadly interested in the intersection of anthropogenic change and avian behavioral ecology. 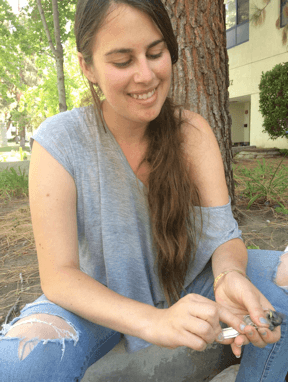 For her Ph.D. work at UCLA in the Yeh Lab, she’s using the Dark-eyed Junco as a model system to understand how birds can cope with and adapt to urban stressors. Though originally from Los Angeles, she moved to the East coast to complete a B.S. in Biology at Davidson College, conducting research on brood parasitism, and an M.A. in Conservation Biology at Columbia University where she explored the evolution of male-like female morphs in hummingbirds. As we continue to urbanize our landscapes, how do species adapt to strong selection gradients and are populations bound to lose diversity? 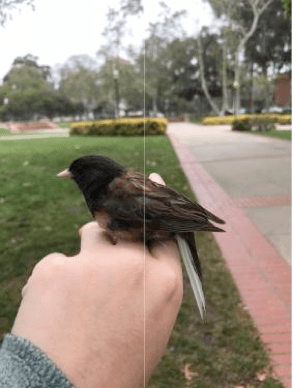 The Dark-eyed Junco has successfully colonized multiple Southern California cities in the past 40 years, making them a model system for testing the patterns and processes of urban adaptation and how successful urban colonization may affect intra-specific diversity. By testing behavioral, morphological, and genetic traits in urban and native juncos, we can determine if populations can undergo different evolutionary trajectories in cities, maintaining trait diversity, and if certain alleles are selected for in cities following colonization.